Heya, thanks for giving permission to use this! 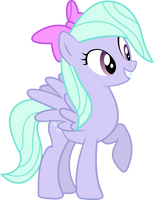 I recently started a blog called Cloudchaser and Flitter Explain, which uses emoticons of various vectors of the aforementioned pegasi ladies talking about various aspects of the MLP:CCG. Sinc eyou asked, you can find a link to that here: cloudchaserandflitterexplain.t… though I can't promise when I'll actually get around to using this particular vector. I'll probably try to use as many new ones in my collection as possible in the next couple weeks, though. Can I use this, please? No profits will be made and you will be fully credited. I noticed I just wasn't sure if it was my vector or someone else's. Let's just say it was yours. Do you have an account there? I'm Dragonshy. yeah I'm Josh on the mlpforums.